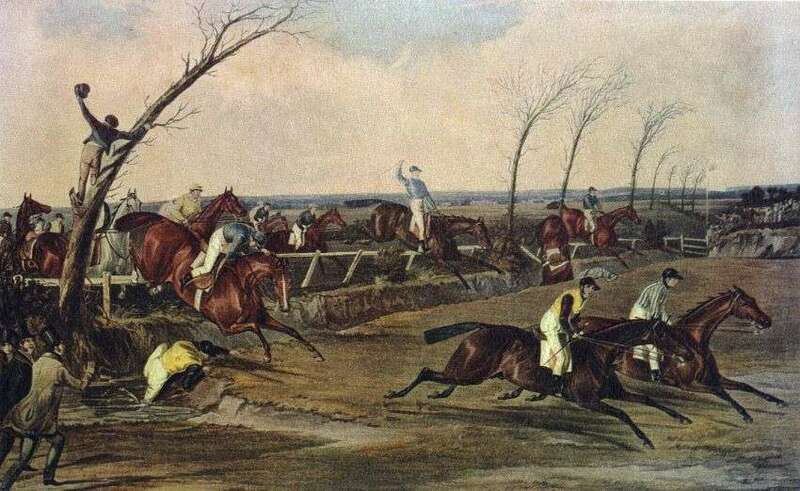 The Grand Liverpool Steeplechase held on Tuesday the 26th February 1839 at Aintree racecourse is regarded by racing historians as the first true running of the Grand National. The starting line that day was near to the Melling Road, the runners were required to race over the four mile course, partially ploughed fields and jump a number of obstacles which included a series of natural banks, plain fences, a stone wall and two brooks. It's widely accepted that you need a slice of luck to win the Grand National, so maybe it was providence that the first winner of that first race was the aptly named Lottery. The 5/1 favourite Lottery wasn't the only one to make history at Aintree that day, alongside the eventual winner at the starting line was Conrad, a horse few people remember. Nevertheless, the name of his jockey lives on – Captain Martin Becher, a retired army officer who served during the Napoleonic Wars, he was instrumental in organising the early race meetings at Aintree and was close friends with the course owner William Lynn. Together they planned an annual ‘Great Chase of the North' to rival the popular steeplechases in the South of England. How dreadful water tastes without the benefit of whisky. It's a cruel twist of fate that Captain Becher is not remembered for being the finest jockey of his era or for helping organise the first Grand National, but instead he is forever associated with falling at the now famous Becher's Brook. The Captain was in second place when his horse hit the brook fence which catapulted him into the water on the far side, as the remaining field of runners thundered overhead, Becher was forced to seek safety in the deepest part of the brook. After the race, he remarked that he had not known how “dreadful water tastes without the benefit of whisky”. It was clear from that first meeting that the ‘National' was destined to become more than just another race, the spectators who witnessed Captain Becher fall could have never imagined the magic of this Annual steeplechase would still be gripping the country 175 years later. Every National has its own story to tell, from Foinavon's unexpected win to Devon Loch's inexplicable defeat, the magic of Aldaniti or the misery of Esher Ness. Names of Aintree legends trip of the tongue, Golden Miller, Corbiere, L'Escargot, Party Politics, Bobbyjo and Papillon. Although the history of the race isn't just about winners, heroic failure adds to the romance of the National too. Anyone who witnessed the Australian horse Crisp power to a 33 length lead in 1973 couldn't help but feel a mixture of heartbreak and elation as Red Rum pounced from the pack to relentless hunt down the tiring Aussie raider, eventually pipping him at the post, Crisp is still regarded as Aintree's most gallant loser. Red Rum want on to win the race two more times, setting a record that still stands today. However, some horses aren't as lucky – spare a thought for Wyndburgh, a horse who finished second on three occasions and placed fourth once but never won! Nor is the race only about equine heroes, every Grand National triumph is a team effort. The horse, jockey and trainer all play and equal part in landing the biggest prize in National Hunt racing. A previously unknown jockey can become a household name in the space of ten minutes, and trainer with a small yard can bank on National success bringing in new owners and training fees, for the big yards the £1 million prize money can propel them to the top of the Champion Trainers table. Regardless of the outcome, one certainty remains for all those involved in the Grand National each year, whether it be the horses, trainers, jockeys, ground staff or spectators – they're a part of history in the making.